Atlanta, GA (February 8, 2018): David Weekley Homes, the nation’s largest privately-held home builder, is excited to announce its launch into the active adult market in the Atlanta area with Encore by David Weekley Homes in Heritage at Towne Lake. Sales are underway in this age-restricted community offering single-story homes priced from the $350s and a future amenity center that will be developed by Weekley Homes. Located in Woodstock, adjacent to the master-planned community of Towne Lake, this gated community will consist of 86 homes. Situated on 72-foot homesites, seven floor plans are available ranging in size from 1,800 to 2,500 square feet and all feature a front porch and two- or three-car garages. Lawn maintenance is also included with HOA dues. Based on innovative real estate research, Encore re-envisions active adult living by combining the privacy of designated amenities with the camaraderie and interaction of a larger community. An amenity center will be built featuring a clubhouse with fitness center, gathering space, outdoor living area and pool. There will also be a community garden and a game room for activities.Other plans will include hiring a lifestyle director to plan daily activities. Located at 105 Sheridan Drive, the Encore by David Weekley model home, The Anglewood, is open daily for tours. 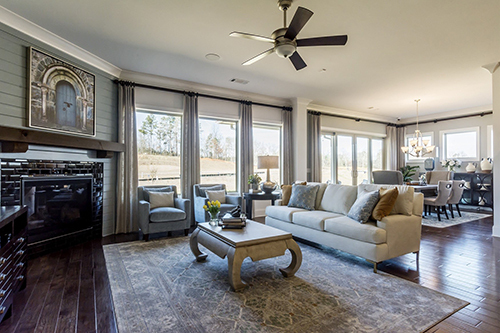 For more information about Encore by David Weekley Homes in Heritage at Towne Lake, contact 404-481-3860. David Weekley Homes, founded in 1976, is headquartered in Houston and operates in 22 cities across the United States. David Weekley Homes was the first builder in the United States to be awarded the Triple Crown of American Home Building, an honor which includes “America’s Best Builder,” “National Housing Quality Award” and “National Builder of the Year.” Weekley has also appeared 11 times on FORTUNE magazine’s “100 Best Companies to Work For®” list. Since inception, David Weekley Homes has closed more than 80,000 homes. For more information about David Weekley Homes, visit the company’s website at www.davidweekleyhomes.com. The Anglewood model home from Encore by David Weekley Homes is open in the 55+ community of Heritage at Towne Lake.